Shimla: The higher hills and tribal areas of Himachal Pradesh had another spell of moderate snowfall while Shimla was lashed by hailstorm and squall for the second day and lower hills experienced widespread rains, disrupting normal life. The rain-related incidents have claimed four lives, 15 heads of cattle perished in lightning, 35 kachha houses and five cow sheds were badly damaged, while roofs of some schools blown away by fierce winds, Chief Secretary V C Pharka said. Two persons were killed and eight injured when a lightning hit them at Khadaan village in Rampur subdivision of Shimla yesterday, while one person and 15 head of cattle were killed in a lightning strike at Dharjot village in Baijnath subdivision of Kangra district. Another man had died reportedly after an accidental fall in Sundernagar subdivision of Mandi district, he said. 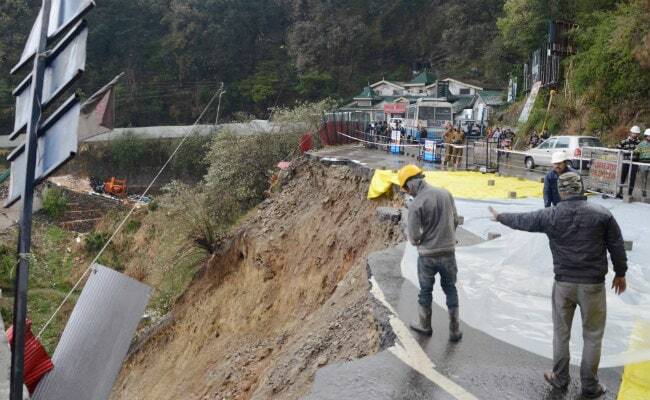 The Shimla-Kalka National Highway caved in near diversion to ISBT where work on construction of ropeway is in progress and vehicular traffic including the buses have been diverted to old bus stand, Shimla Deputy Commissioner Rohan Chand Thakur said after visiting the spot. The National Highway officials have been asked to take immediate measures to ensure that the sliding of hill did not aggravate, he added. 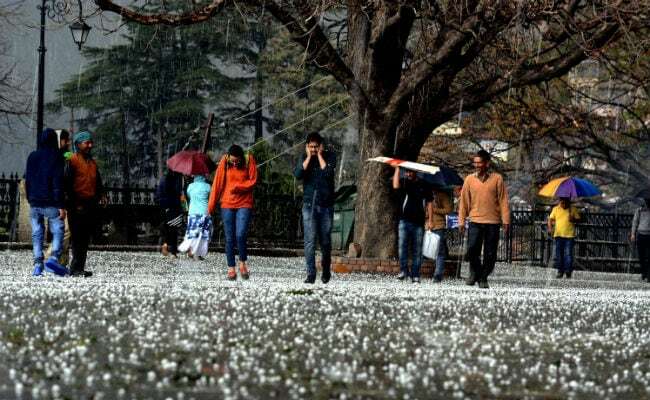 Shimla and surrounding areas were lashed by severe hailstorm which blew off boards and hoardings, twisted TV antennas and reduced visibility considerably, forcing vehicles to run with headlights on even during the day. The Hindustan-Tibet National Highway was closed due to landslides and snow from Pangi Nallah to Shipkila. Shimla received 62.2 mm of rains, while Kalpa in Kinnaur had 16 cm of snow and 52 mm rains which broke the record of 2002. Director Meteorological Department Manmohan Sharma said 12.3 mm actual rainfall has been experienced in the state as against normal rainfall of 2.6 mm yesterday, which is 381 per cent from normal. Chitkul, Kalpa and other higher hills received 16 cm to 25 cm of snow, while Rohtang, Kunzam, Saach and Chansel passes had 15 cm to 30 cm of fresh snow. Marhi, Keylong, Koksar had eight to 10 cm of fresh snow. The region experienced widespread rains and Kalpa had 70.4 mm participation, while Kumarsain, Shimla and Manali received 56.4 mm, 55.7 mm, and 50.4 mm rains, respectively, till this evening, followed by Bhuntar (50), Rampur (47), Bajaura (46), Jubbal (37), Sunnibaji and Bhoranj (32), Dalhaosie (30), Mashobra (28), Sarahan (27), Khadrala, Solan and Sujanpur (all 26), Keylong and Nadaun (25). The maximum temperature dropped to 4.6 degrees Celsius at Kalpa, while minimum temperature hovered around freezing point. Una was hottest with maximum temperature at 32.0 degrees Celsius, followed by Sundernagar (30.8), Bhuntar and Nahan (both 28), Solan (25.4), Dharamsala (24.6), Shimla (21.1) and Kalpa (4.6). The minimum temperatures remained low across the region and Keylong recorded a low of 1.6 degrees Celsius, followed by Manali (3.6), Shimla (6.3), Dharamsala (10.8), Bhuntar (11), Palampur (12), Solan (12.2), Nahan (12.9), Sundernagar (13.7) and Una (17.5). The local MeT office has predicted rains or snow in mid and higher hills over next two days and thundershowers at many places in lower hills over next two days.